If you’re the sort of man who likes things simple, then you’ll want to check out our range of men’s easy-fasten trainers. You need only slip your foot into them and attach the straps with a quick touch before heading out. Touch fasten isn’t just for the hurried, either – if circumstances are interfering with your ability to lace up, then some easy fasten trainers might make just the required solution. Our team has searched far and wide to assemble a selection of high-quality men's trainers from reputable brands like Gola, who provide easy-fasten trainers in both black and white and Hi-Tec, a legend of the sportswear market. 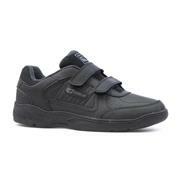 Men’s touch fasten trainers of this quality are sure to remove the hassle from an active lifestyle. And you needn’t pay excessive prices for the privilege either. All our footwear is reasonably priced, and our easy-fasten trainers are no exception. What’s more, you’ll benefit from free standard delivery on just about every item you find here. Whatever your age, and whatever size your feet are, you’ll be able to find a pair of men’s easy-fasten trainers to match your needs here. And they’re not just designed for sports – they’ll also slot quite easily into a range of casual situations, too. There’s also plenty more in our men's shoes section, ranging from trainers to boots to slippers and everything in between! 9 products from £12.99 to £39.99.